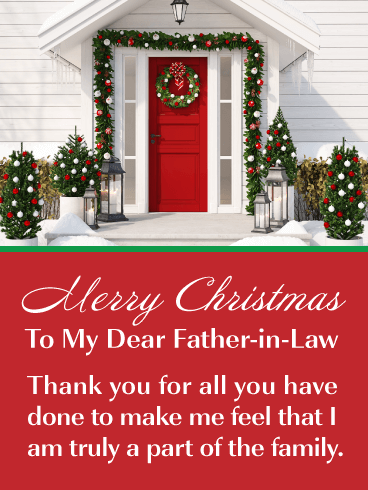 Send a heartwarming holiday card to your father-in-law this year by getting this thoughtful Christmas card out to him today! It showcases a charming and welcoming front door that is decorated with a sensational Christmas wreath and seasonal ornaments. The card’s message will thank him for all he has done to make you feel that you are a part of the family. This will fill his heart with joy. Don’t delay, send this outstanding Christmas card out today! Holly berries and ivy grow thick this time of year, but Christmas doesn't really start until the tree is up. Let your sister know how much your traditions of decorating evergreens and spruces when you were both young meant to you, and how every Christmas you think back on your childhood. 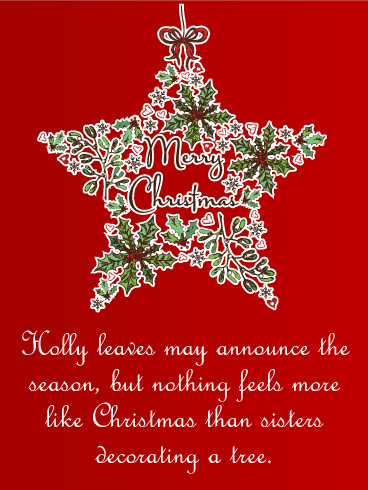 This year, Christmas is for sisters. Send a wreath full of Christmas wishes. From ice skating on the pond to presents under the tree to listening for hoof steps on the roof, the holiday season is full wonderful experiences saturated in magic. It's always hard to pick a favorite! Share them all with those you love by sending this fun-filled Christmas wish card. Do you love the smell of fir branches during the holiday season? The fir branch frame on this Christmas card will make you remember the sharp smell of real Christmas trees and wreaths! This Christmas card features a bright red ribbon and fir branch frame, decorated with presents, ribbons, stars, ornaments, and bells, all on a red background. Send it to say "Merry Christmas" today! Make your family feel the power of your hugs with this Christmas wreath! While you may be far away, this evergreen wreath will circle your loved ones with merriness and joy befitting of the season for you! Filled with tasty candy canes, glowing stars, shimmering baubles, and dusted with snow this wreath fills your long distance hug with the sensations of the season! Decorations are one of the best parts of Christmas celebrations! 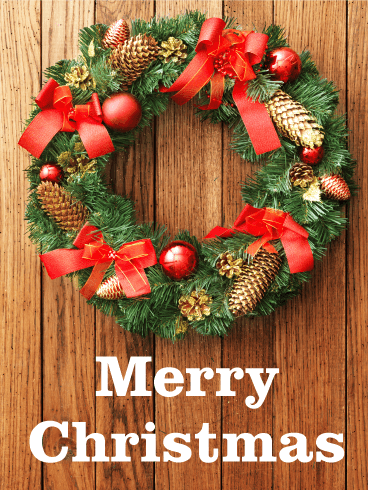 Send a cheery decoration to your friends and family with this red Christmas wreath card! 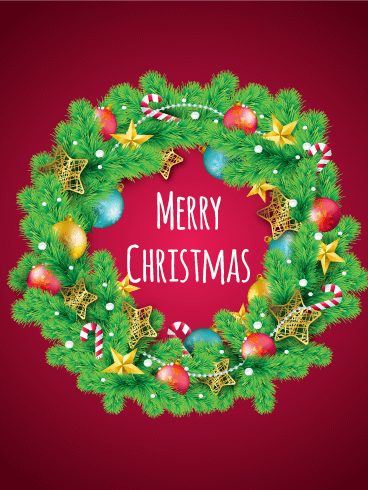 The bright red background features a large Christmas wreath adorned with ornaments, stars, cranberry chains, candy canes, holly, silver bells, and bow-wrapped presents. 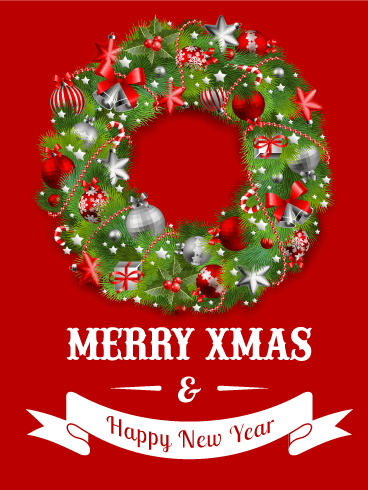 Say "Merry Xmas & Happy New Year" with this great Christmas card! 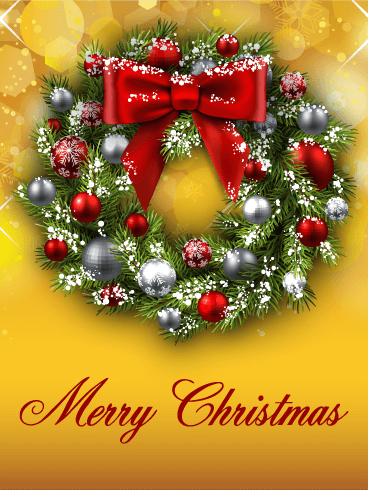 Wish your loved ones a "Merry Christmas" with this shining Christmas wreath card! This brilliant card features a gold background with shining lights and stars. The large, snow-dusted wreath in the center is decorated with ornaments colored red, silver, gray, and red with white snowflakes. 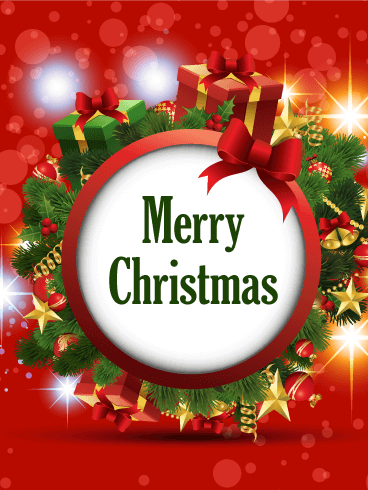 A fancy red font is used to say "Merry Christmas" to everyone who receives it! 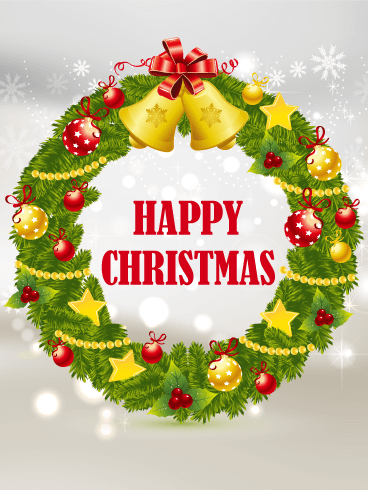 What is the best way to say Happy Christmas? 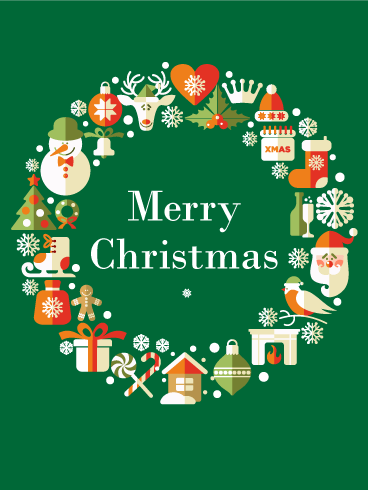 With this Happy Christmas Wreath Card! The light and dark gray background showcases intricate white snowflakes and balls of light. The large wreath has red and gold ornaments, bright yellow stars, boughs of holly, and strings of yellow beads. Two golden bells are tied with a shining red ribbon as they hang over a message of "Happy Christmas" for your friends and family. Do you have a wreath on your door? Get one on a Christmas card! 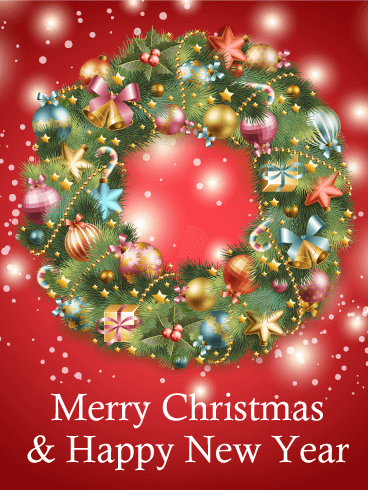 Send this gorgeous Christmas wreath card to wish a Merry Christmas & Happy New Year to everyone you know! This red Christmas card features bright white lights around a beautiful Christmas wreath. Strands of golden beads, boughs of holly, stars, candy canes, ribbons, presents, and ornaments of all colors and size adorn this gorgeous wreath for all who receive it! Do you know someone who loves nature and the outdoors? Send them this Pine Cone Christmas Wreath Card to wish them a Merry Christmas this holiday season! The cheery Christmas wreath on this Christmas card is decorated with red and gold ribbons, pine cones, and shining red ornaments, all resting a rustic wood floor. Send some Christmas cheer by choosing this Christmas card today!